The MAX1852 MAX1853 monolithic, CMOS charge-pump voltage inverters in the ultra-small SC70 package feature a low 15 output resistance, permitting loads up to 30mA with maximum efficiency. 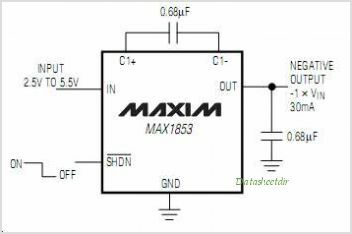 The MAX1852 MAX1853 are available with operating frequencies of 50kHz and 200kHz, respectively, allowing optimization of supply current or external component size. Small external components and micropower shutdown mode make these devices ideal for both battery-powered and board-level voltage conversion applications. Oscillator control circuitry and four power-MOSFET switches are included on-chip. Applications include generating a negative supply from a +5V or +3.3V Logic supply to power Analog circuitry. Both versions come in a 6-pin SC70 package that is 40% smaller than a SOT23. This is one package pinout of MAX1852,If you need more pinouts please download MAX1852's pdf datasheet. 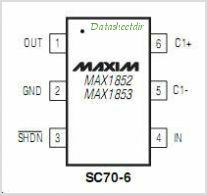 This is one application circuit of MAX1852,If you need more circuits,please download MAX1852's pdf datasheet.